Are you sure that you can detect an APT malware? YES or NO, whichever, try ShinoBOT; this is a BOT or RAT simulator for security assessment, pentesting. Usually, when you want to try a RAT, you must build a C&C server, prepare a global IP address, get a domain name. In case of ShinoBOT, the C&C server is provided as a service, so you just need to download the ShinoBOT.exe. ShinoBOT has a GUI and shows a password. The only guy who knows the password can control the host. This is one of the most important things to make difficult ShinoBOT to be abused for the real attack. You can share your nice hacking command for everyone. If you not familiar about the internal recon phase, you can refer other's command. No fee to use ShinoBOT/ShinoC2. If you like it, just share it to your friend. After the execution of ShinoBOT, it starts the polling to ShinoC2(here). The C2 communication is based on HTTP(S), so it works with the web proxy environment. After the assignment of command, ShinoBOT downloads the command. It executes the command and get back the result to ShinoC2. 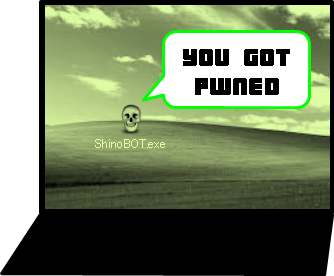 Execute ShinoBOT on your "victim" machine. The GUI will appear so write down the password. Find and click your host on the HOST. Put the password and now you can control your host. Easy peasy. Please use ShinoBOT at your own risk. I take no responsibility or liability, of any damage, leakage.